Hey Bruce Trail, it’s been a while! Back even in my earliest days of blogging, I decided that I was going to hike the entire Bruce Trail. It might take a few years or it might take a decade, but I’m determined to walk the whole way eventually. Yes, all 900km of it. 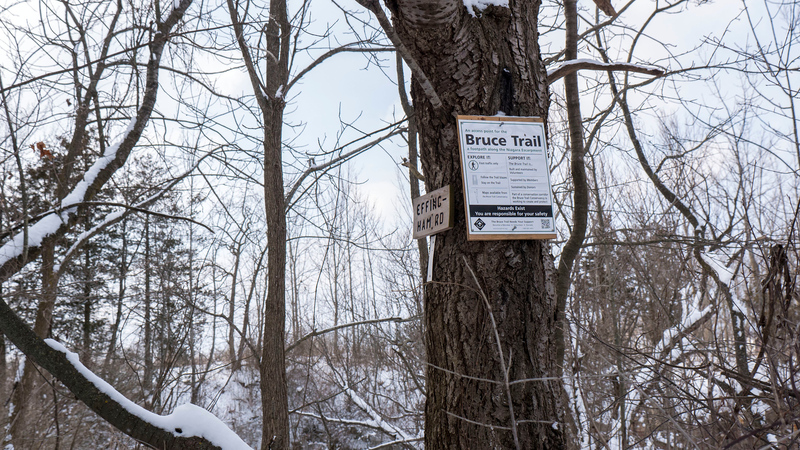 For those of you who aren’t familiar, the Bruce Trail is one massive trail that runs throughout southern Ontario, from Niagara to Tobermory. I’ve embarked on seven Bruce Trail hikes so far, but my last one was over a year and four months ago. Ouch. Finally, it was time to get out there and hit the trails, despite the weather. It was February, the height of winter in Southern Ontario, but I didn’t let that stop me. On my last Bruce Trail hike, I attempted my first solo hike. While that was a great experience, it’s always more fun to hike with a friend. Plus, I’m not sure that I’m ready to hike by myself in the winter. After hiking this particular section of trail in the winter, I’m really glad that I didn’t go it alone. 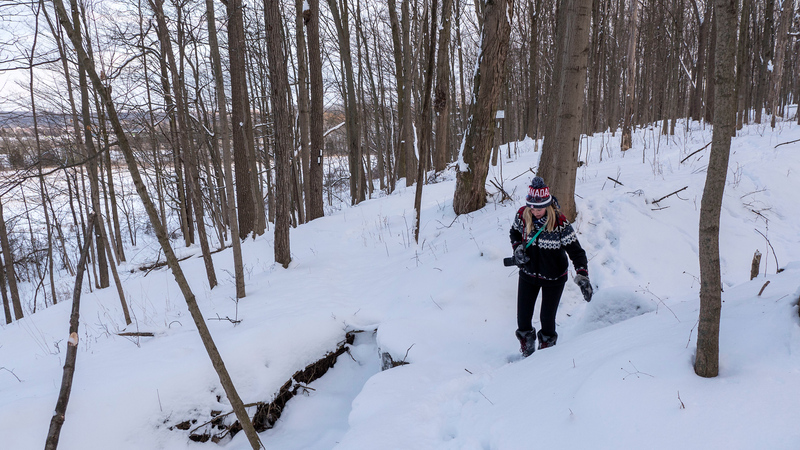 My hiking partner for Bruce Trail Hike #8 was fellow travel blogger, Lindsay. Lindsay also loves hiking and she happens to be from this region, making her the perfect hiking buddy for the day. However, at the beginning of the day, we had no idea what we were getting ourselves into. 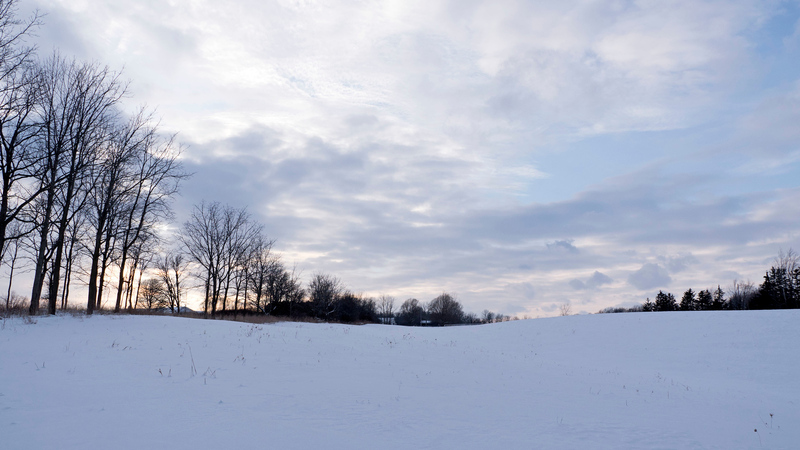 Do you ever go hiking in the winter, and where? 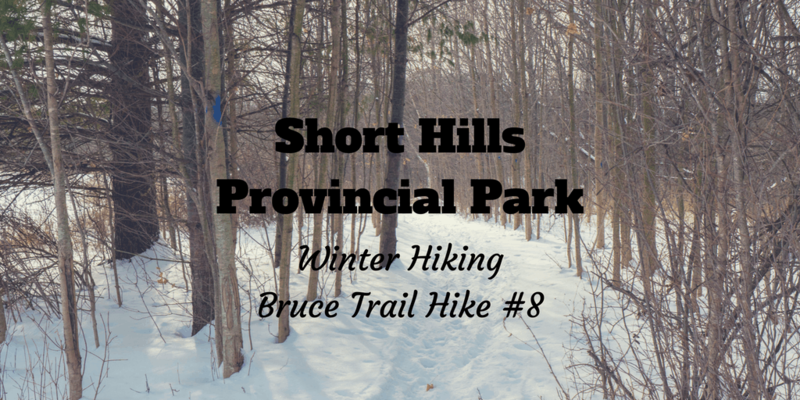 Wait a minute, didn’t I hike Short Hills Provincial Park on my last Bruce Trail hike? 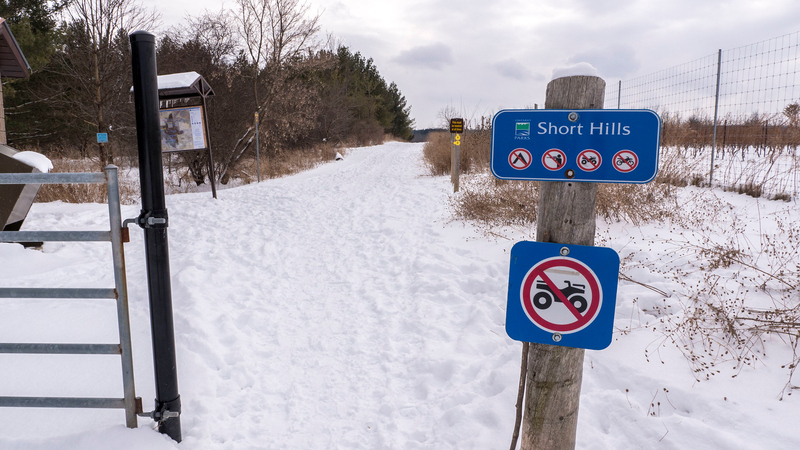 I almost got to the western edge of Short Hills Provincial Park last time. 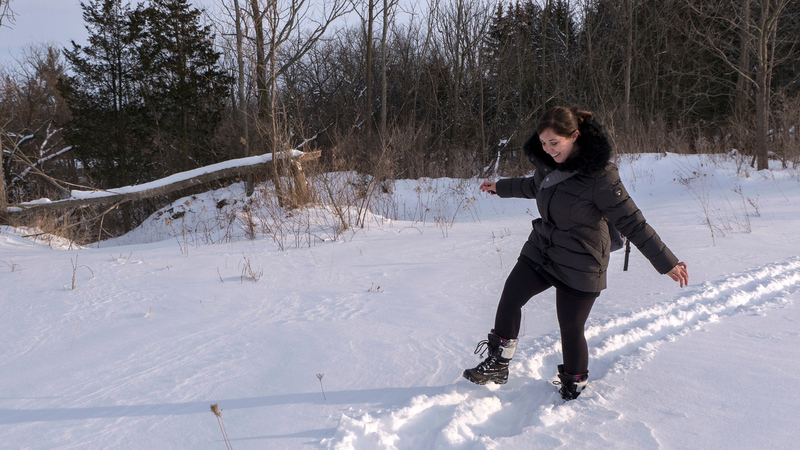 However, Lindsay wanted to hike part of the park as she had never done it before, despite growing up in the region. I didn’t mind hiking around there for a second time. We had two cars at our disposal this time. Usually, I will park my car at the beginning, hike a section of the trail, and hike back to the car. Essentially, I’m hiking the entire Bruce Trail twice because I’m hiking to a certain point and then back to my car. This time, we parked one car at the end and one car at the beginning. That way, we were able to walk twice as far as normal. 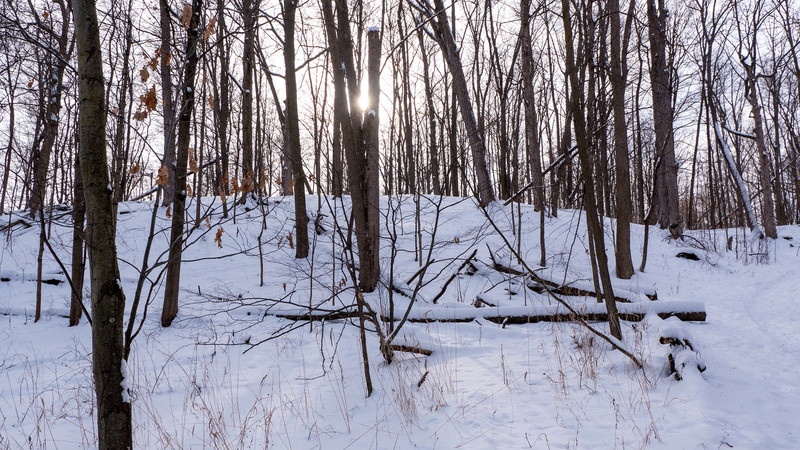 I also didn’t mind hiking at Short Hills Provincial Park for a second time because I’d never seen it in the winter. 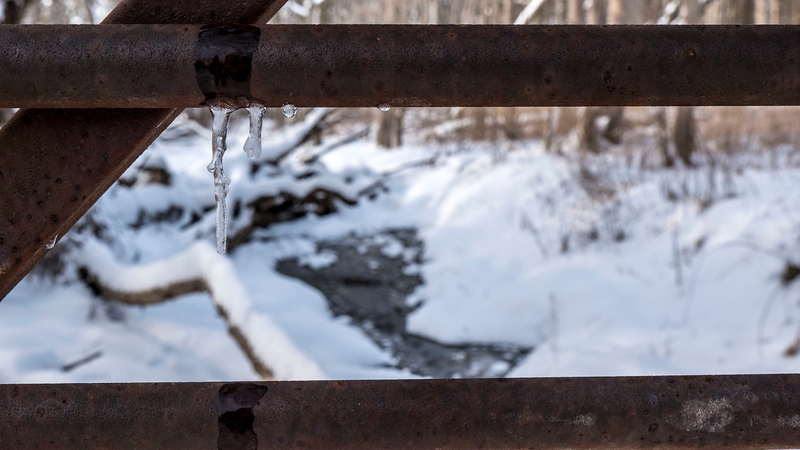 As I’ve learned from exploring waterfalls in Hamilton, these natural wonders look completely different from season to season. That doesn’t include the part where we got lost. More on that soon. Might seem like a no-brainer, right? 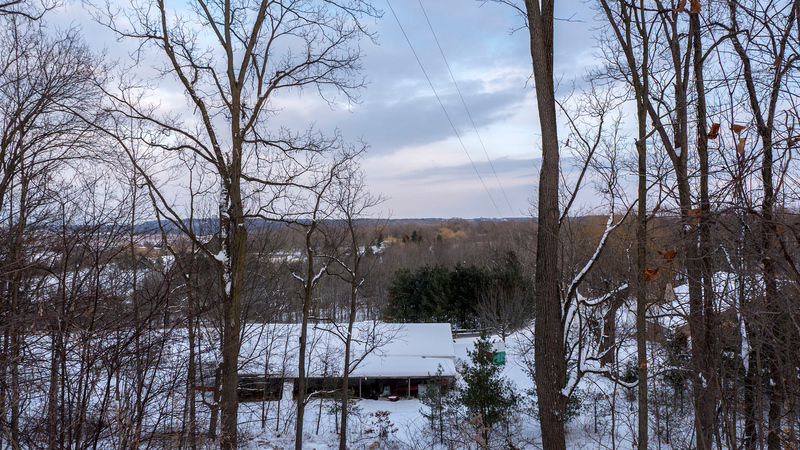 Located on the southern side of the Niagara Escarpment (one of 13 UNESCO World Biosphere Reserves in Canada), Short Hills Provincial Park contains an immense amount of small, steep hills, as well as valleys carved out by the last ice age. 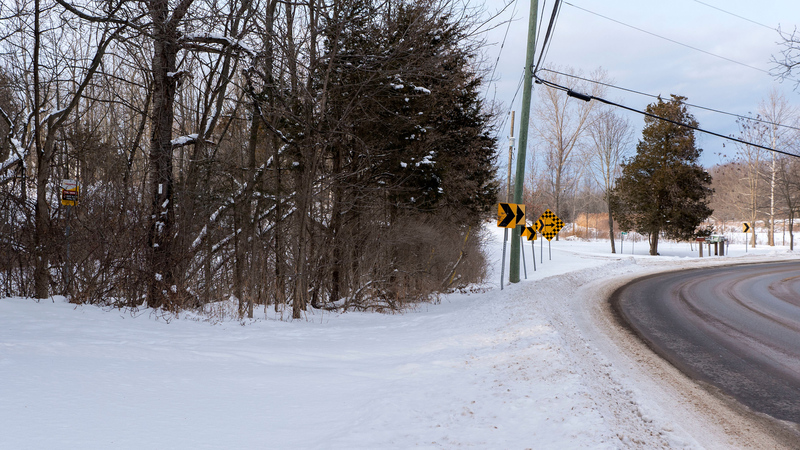 In the winter, these short hills are a grueling workout for your legs, even more so than the other seasons. Hiking through the snow makes it even more difficult than usual. 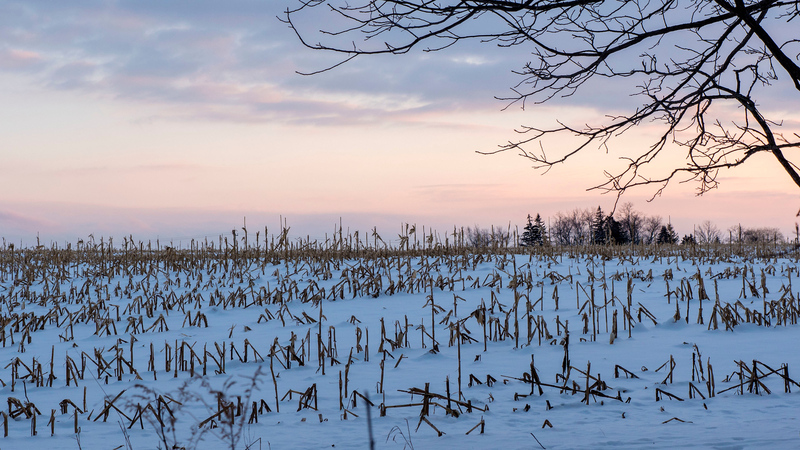 Be sure to pack your winter boots, especially ones with a good tread on the bottom. Going up and down all of the hills can be a little treacherous, and you don’t want to fall in the snow! 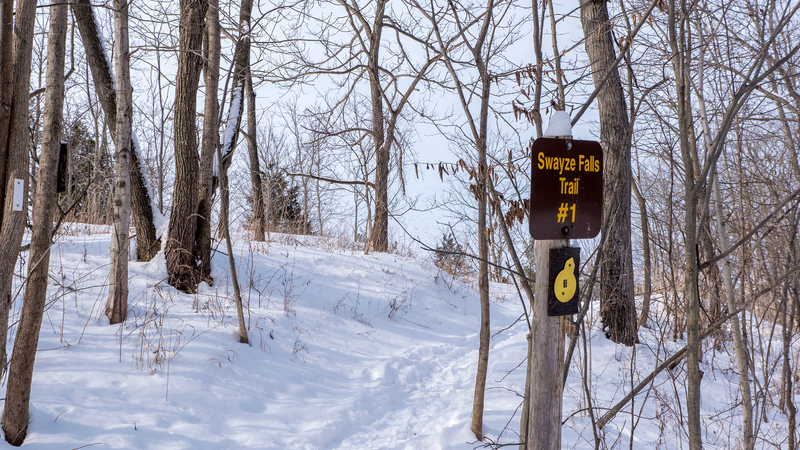 We followed the Swazye Falls Trail, which also followed the same path as the Bruce Trail. And the path started with an incline up a short hill. We actually didn’t see one single person hiking the trail with us. 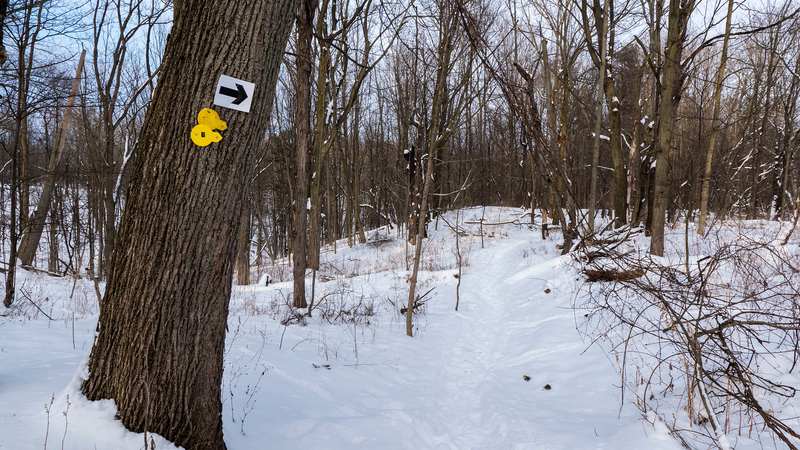 For this section of the Bruce Trail, there were a few sets of footprints, so it gets some use. 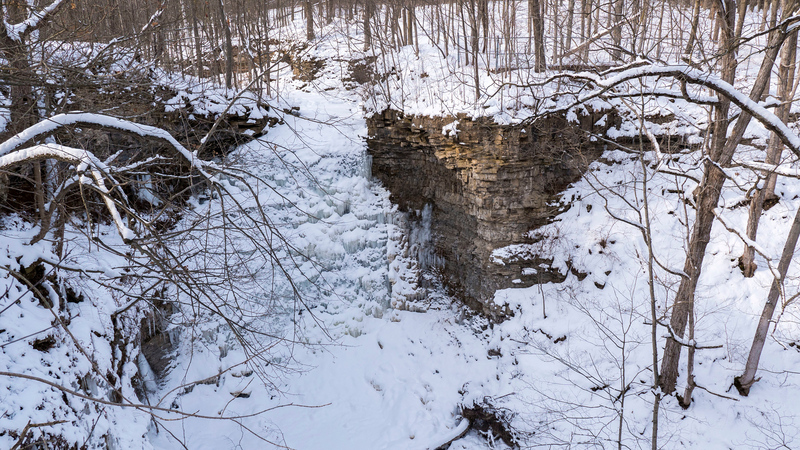 The Bruce Trail continues beyond Short Hills Provincial Park and Swazye Falls, but the Swazye Falls Trail is one giant loop in the park. 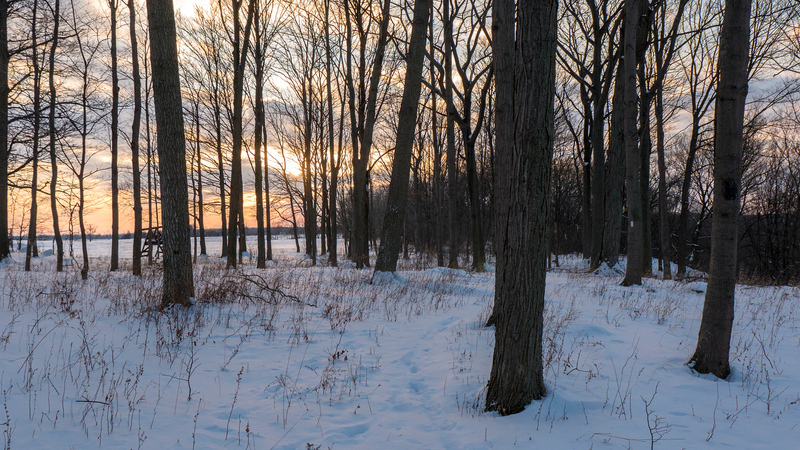 If you’re looking for some peace and quiet, you’ll find it at Short Hills Provincial Park in the winter. The only sounds we heard, beyond our own chatting, were the tree trunks creaking in the breeze and the odd woodpecker hammering away at the bark. 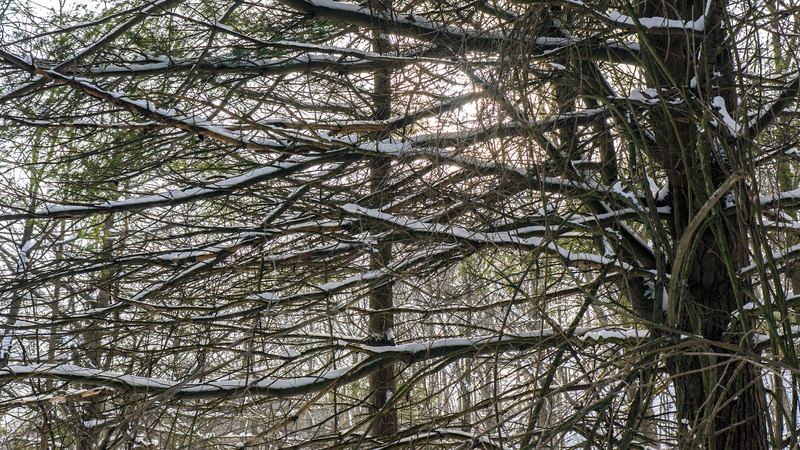 The tree branches were covered in a layer of snow, and drifts of snow formed around each trunk. 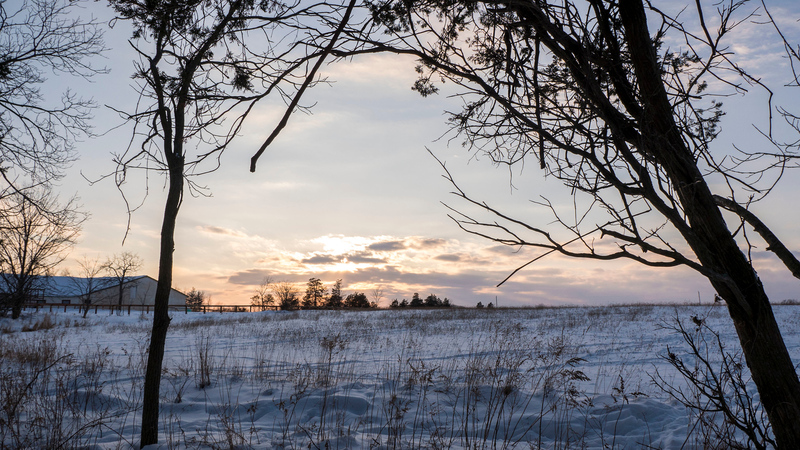 Short Hills in the winter truly epitomized a winter wonderland. You might recall Swayze Falls from my last hike on the Bruce Trail. It was the fall, and unfortunately, there wasn’t much to see. Swayze Falls had completely dried up and there was no waterfall to be witnessed. All I saw before was a barren cliff. Swayze Falls in the winter was an entirely different experience. This time, it did not disappoint. Lindsay and I could hear the sound of rushing water as we approached Swayze Falls. In the winter, it was a brilliant, frozen waterfall. The water still rushed beneath this massive clump of ice, lightly dusted with snow. It’s amazing how these natural wonders change with the seasons. From here on out, the Bruce Trail was uncharted territory for me. At last, I was hiking beyond where I left off last time. As I’ve discovered on past hikes, it’s very easy to get distracted and wander off course. 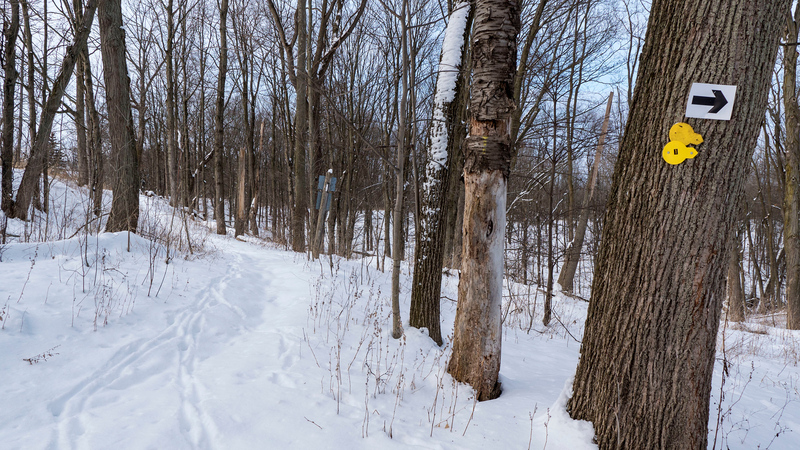 The Bruce Trail is really well marked with white blazes along the trail. Even still, I manage to get lost or veer off the trail on pretty much every hike. Everything was going pretty well. 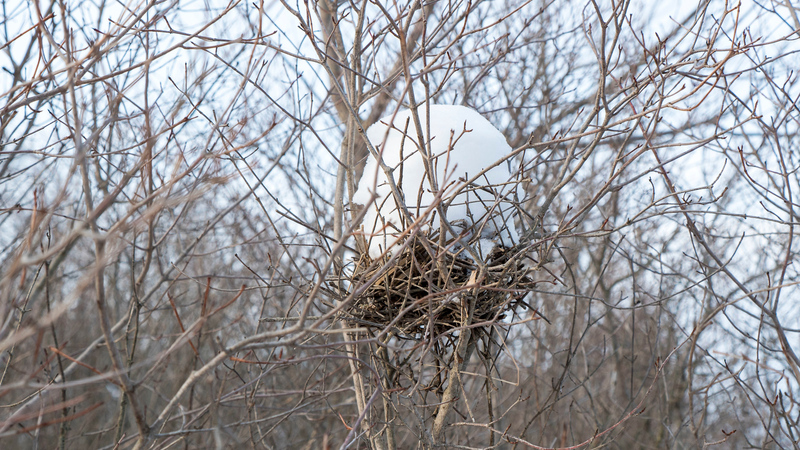 Lindsay and I discovered an adorable bridge over a small creek, as well as bird nests topped with mounds of snow. Around every turn, there were new discoveries. I wasn’t even feeling that cold. Hiking up and down all of the hills kept my body warm. After a while, I looked around and didn’t see any white blazes on the trees. After Lindsay and I searched around for the markers, we realized that we must have wandered off the trail. We realized we were on the Swayze Falls Trail, but this was no longer the Bruce Trail. The trees had some yellow markers and even a few blue blazes, but no white marks. The two of us began to retrace our steps. This took a lot longer than we originally thought. As it turns out, we had walked quite a ways off the trail. 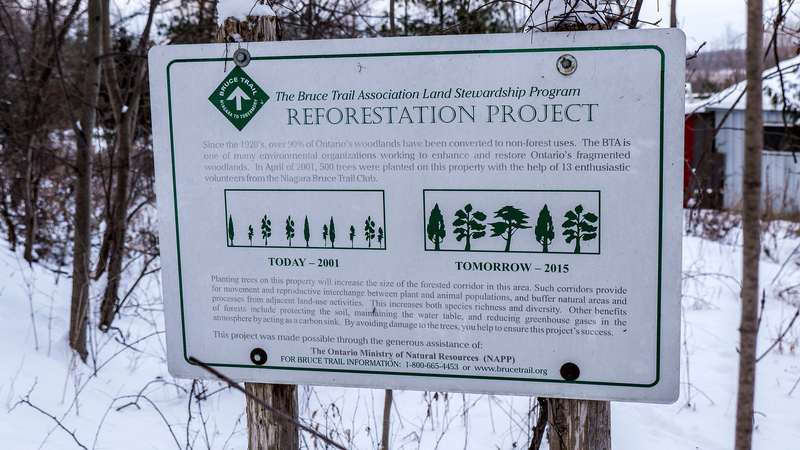 Finally, we reached the Bruce Trail again and realized where we went wrong. Do you see the arrow and marker on this tree? Follow the path to the left. You might see a white blaze waaaaay off in the distance. Can you see why we easily got confused? 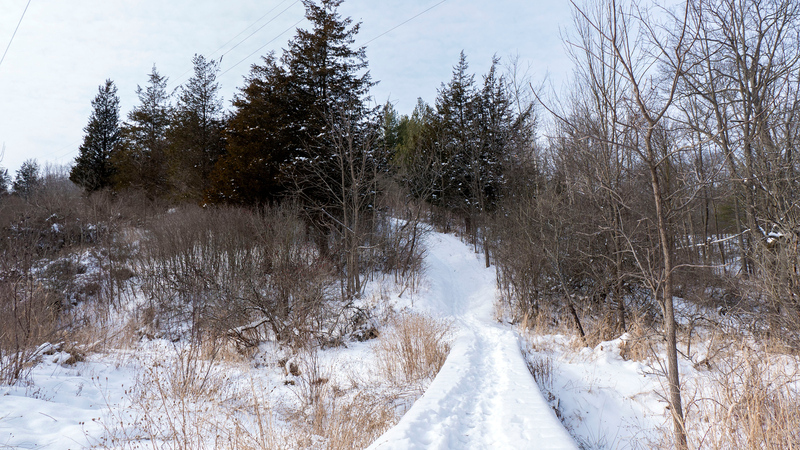 Thankfully, our phones worked and you can actually see the Bruce Trail marked on Google Maps. I also have a paper copy of the Bruce Trail reference guide in case my phone dies or doesn’t work. However, that paper copy isn’t exactly useful when it comes to determning your precise location like a GPS signal. We forged ahead and continued on our way. Getting off track added a lot of extra time to our hike. Little did we know, the most challenging part of our journey was still ahead of us. 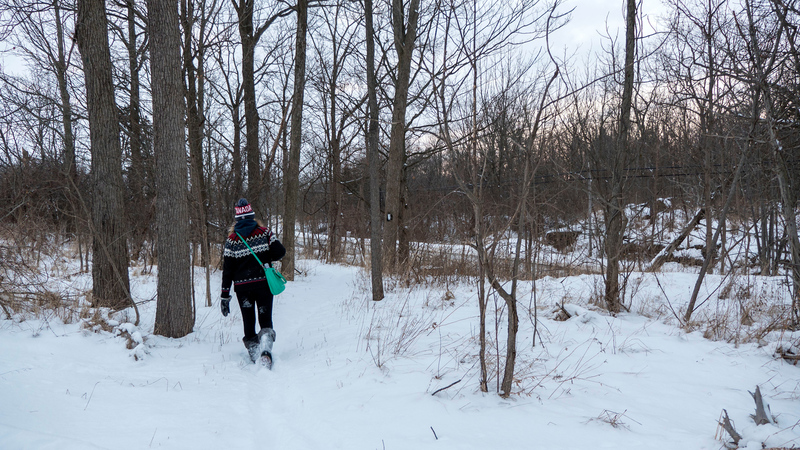 Before long, we were out of Short Hills Provincial Park and walking along a city street. 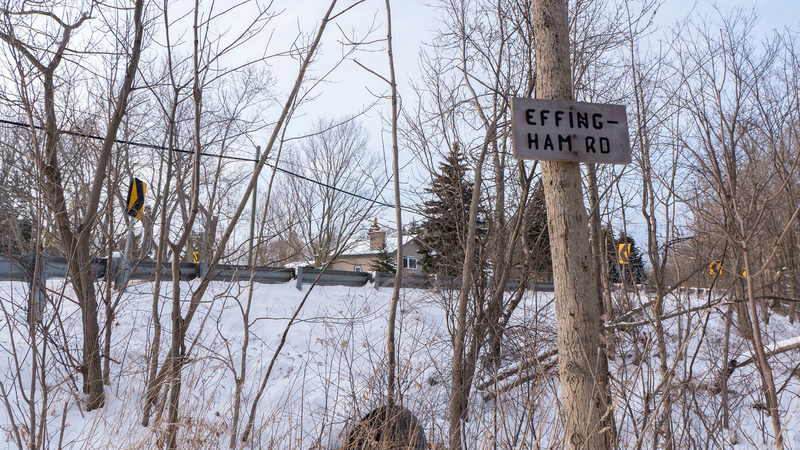 You’ll only take a quick jaunt along Effingham Street until you’re back on the trail. The Bruce Trail does continue on this main road as a means of connecting the trail from one side to the other. Just look out for the white trail blazes and you’ll be on your way. 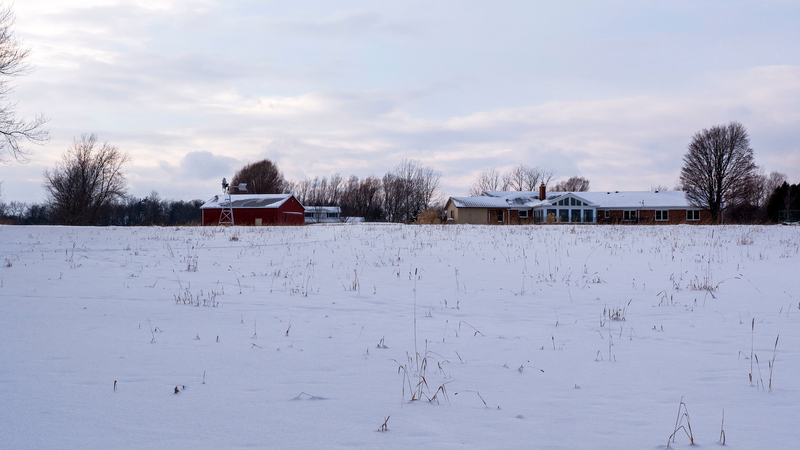 At this point, the Bruce Trail winds behind farmland and into privately owned property. 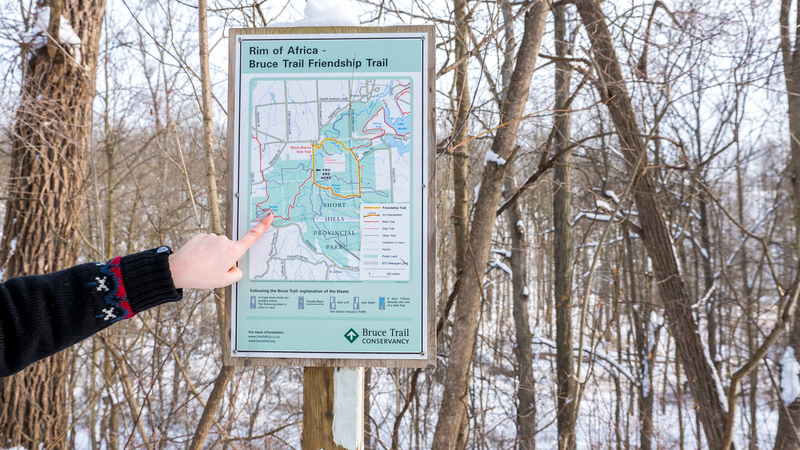 The Bruce Trail Conservancy operates on a handshake agreement with many landowners. 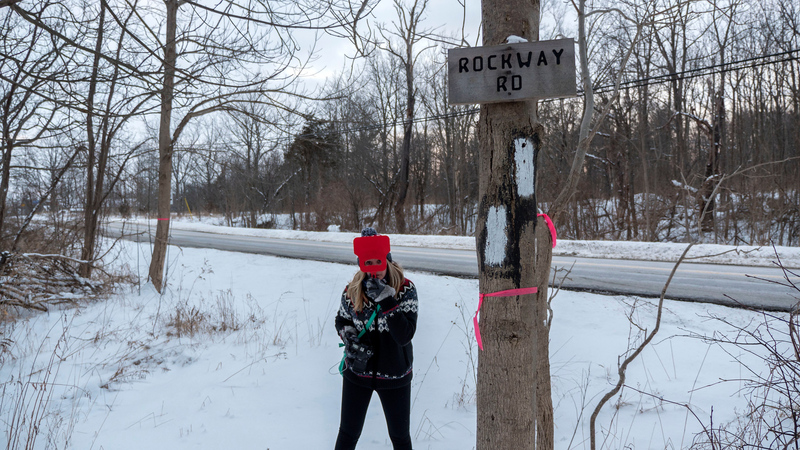 The property owners allow hikers to pass through sections of their land, usually at a distance from their home, as long as the hikers are respectful. The hikers should move along at a regular pace and not leave any trace. It was clear that no one had hiked this “path” for some time. I put path in quotation marks because it was nearly impossible to tell where the trail existed. Everything was buried beneath a foot of snow. We hiked along the countryside and back into the forest. There were some small ladders for hikers to climb up and over wire fencing. Naturally, we saw these as photo opportunities. Oh, and at some point, I lost my lens cap in the snow. There’s never a dull moment! “Tomorrow” is now…or three years ago, even! The hike took a sketchy turn. As we hiked through the forest, it became nearly impossible to tell where the trail was located. 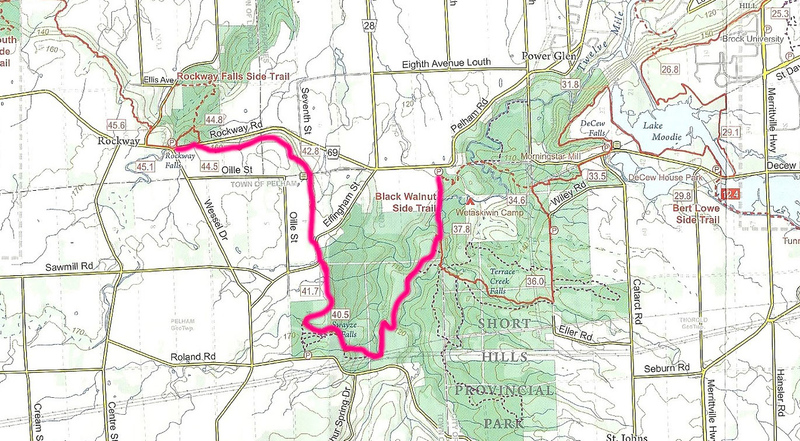 The Bruce Trail blazes were few and far between on this section of privately owned property. In some areas, there were rocks with steep ledges that were difficult to walk across. While we could walk down between some of the rocks, we were certain that this was actually a frozen riverbed. I put one foot down on the snow, and the ground creaked below my foot. Upon spreading the snow away, I verified that this was frozen water. I couldn’t tell how deep this river was, and if I could potentially break through it. There were also lots of sticks and twigs protruding from the ground that thorns on them. These thorns stuck into my legs from time to time. As my legs were fairly cold, it was more painful than usual. I was starting to grow tired of this challenging hike. The sun was going down, and I was getting colder. Hungrier. Crankier. 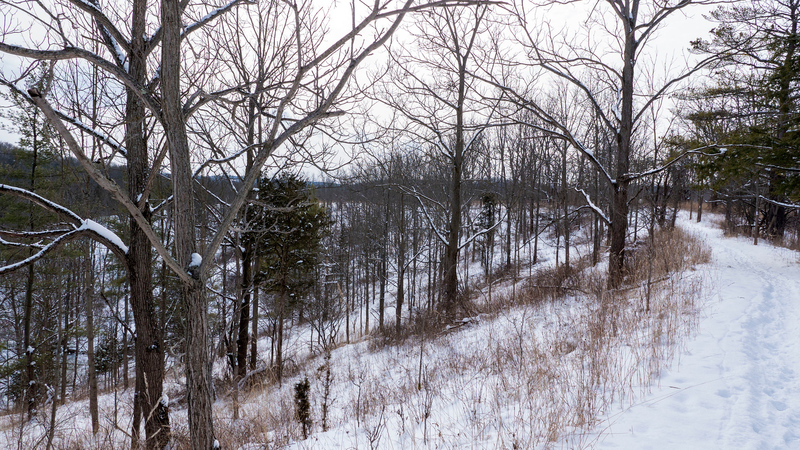 I groaned when I saw a white trail marker way at the top of the escarpment. The sun setting in the distance rejuvenated my spirit. Even though I was very tired and cold, this beautiful scene lifted my spirits. I pressed on, knowing that we couldn’t be too much farther from the end. Even though the trail was buried beneath the snow, we managed to follow a set of deer prints for most of the time. It was quite amazing that the deer seemed to sense the path’s twists and turns. I didn’t realize that deer stuck to paths like this. But, I imagine that it’s easier for some larger animals to walk along the path without any obstructions in the way. The deer has probably wandered this section of the forest hundreds of time and knows the path by heart. My legs were tired and frozen. They no longer felt like they were attached to my body. At one point, I was climbing down some rocks and took a little tumble. I could barely find the energy to stand back up. Finally, we saw a clearing. It was the main road that led to where my car was parked. At last, we were almost finished our hike for the day. A random hunk of red plastic was hanging on a tree branch. 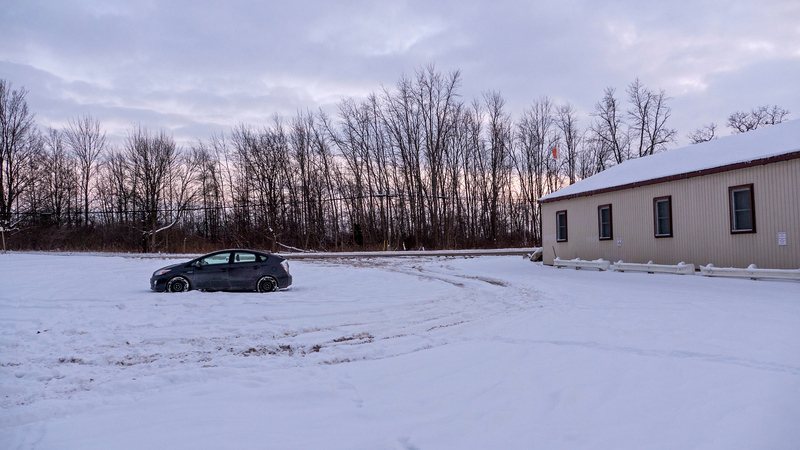 I was so happy to see my car, parked at Rockway Community Centre. We made it back before the sun went down. Lindsay and I definitely earned our dinner and celebratory coffees (yes, more than one!). While I might have grown tired, weak, and even a little bit grumpy towards the end of the hike, it’s all part of the adventure. Something I love about Bruce Trail hikes is that you never know what you’re going to get. With every hike, I discover new places that I would have never visited otherwise in my home province. There’s always something interesting or a story to tell by the end of the trip. 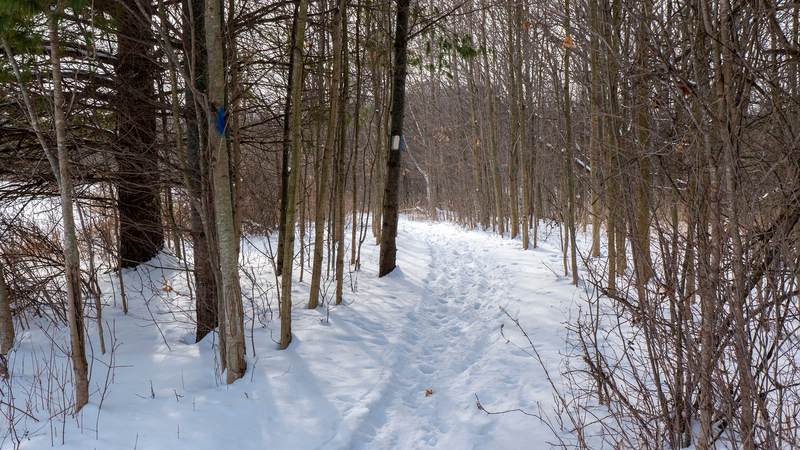 If you’re thinking about hiking the Bruce Trail throughout Ontario, be sure to check out my other blog posts. They’re all listed on my Bruce Trail Hiking page. To see all the photos from this hike, please visit my Bruce Trail Hike #8 travel photography album. Not only can you view my photographs, but you can also order prints, canvas wall hangings, and housewares made from these photos! It’s the perfect gift for that travel lover in your life! I’m so glad you didn’t have to do that section of trail solo. Could you imagine doing that cliff in reverse?! I think going downhill may have been harder! We survived though – yahoo! Thanks for retracing some of your steps too. Overall it was a fun day! All is well that ends well, I guess! I can imagine how scary it is when you’re the only people on the hike and there is no one else you can see for miles and it is so easy to get lost, especially when you’re attempting such a hike in the winter and the trail is actually covered in snow. I’ve never heard of Bruce trail myself and its crazy that it extends to 900kms in all! These kind of challenging hikes are best done with someone rather than solo, and more people, the better. You are so brave. Hiking with so much snow all around is not easy even when you are wearing the best of shoes. Thank you for hiking and bringing back these visuals for us. The frozen waterfall is so endearing. I can only imagine how it would be to stand in front of it. Oh wow, quite the goal to hike the entire Bruce trail! Good on you! Totally agree that some regions are worth exploring for a second time to see the difference from season to season. 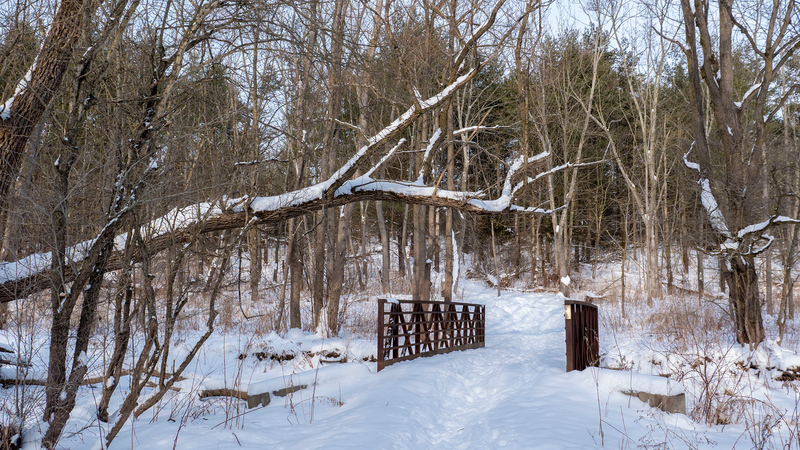 Short Hills Provincial Park looks beautiful during winter – and how incredible that there wasn’t a single other person to have to share it with! A true outdoor playground. 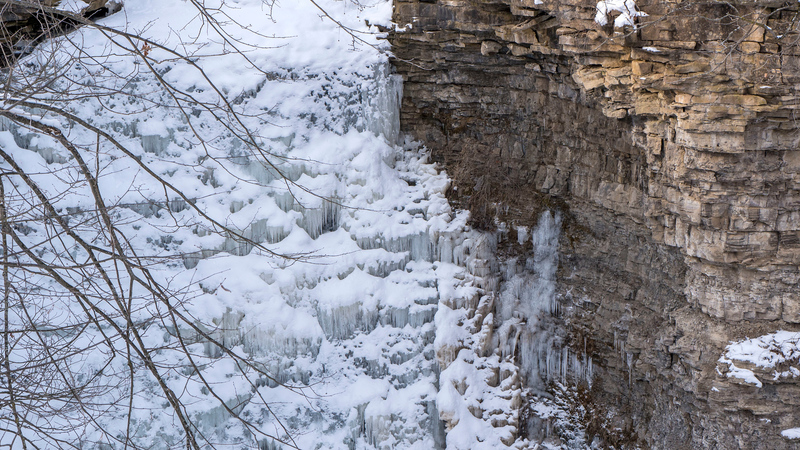 Swayze Falls frozen looks so magical! 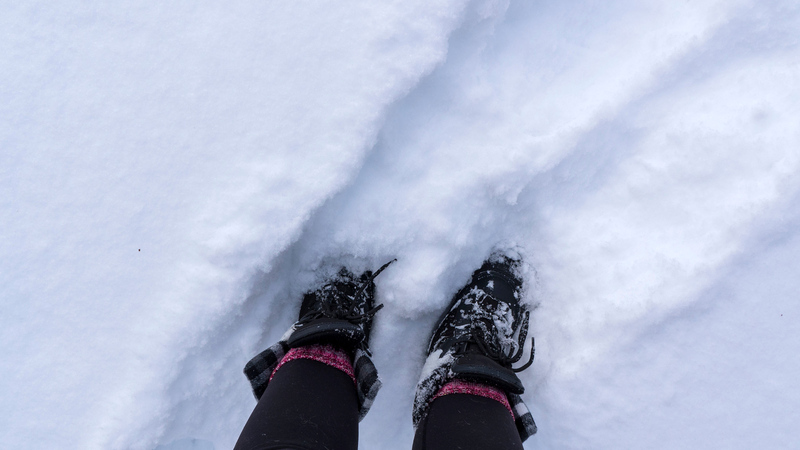 Definitely have to be prepared with safety in mind when hiking through the snow though – I can see how people might easily get lost and not be able to find the trail back. Glad you had a great time overall though despite being a bit cold and grumpy towards the end! I have those feelings towards the end of some hikes too, but as you said, it’s all part of the adventure! This looks so pretty! 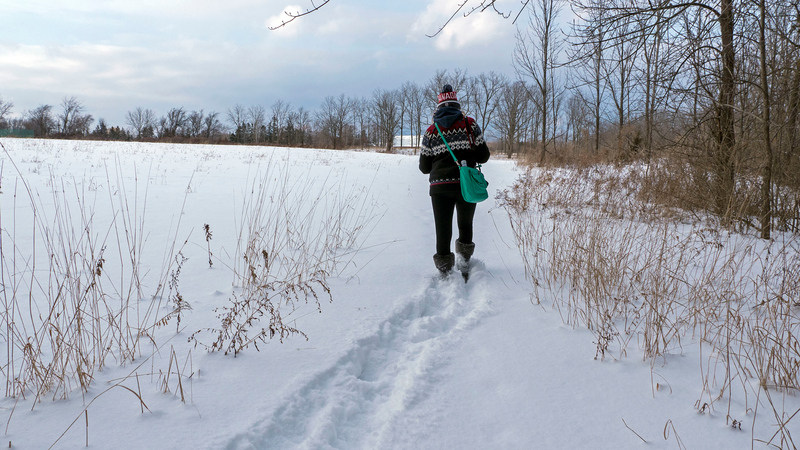 I love a good winter walk, although I’m not sure my boots or fitness are up to the task of a full on hike! I can’t believe you were all alone – how magical, and I presume silent?! I love how pretty Swayze Falls is – it’s like something out of a movie! This is mesmerizing! I was so worried when you were by the frozen river – I’m glad that you were dry no matter what. It looks like a gorgeous part of the world. I’m glad that you guys made it back before the sun set! What a fun adventure. Swayze Falls look really pretty! I have the same type of “adventures” like losing my lens cap places or breaking an arm… You never know ;) So, I totally feel your pain. 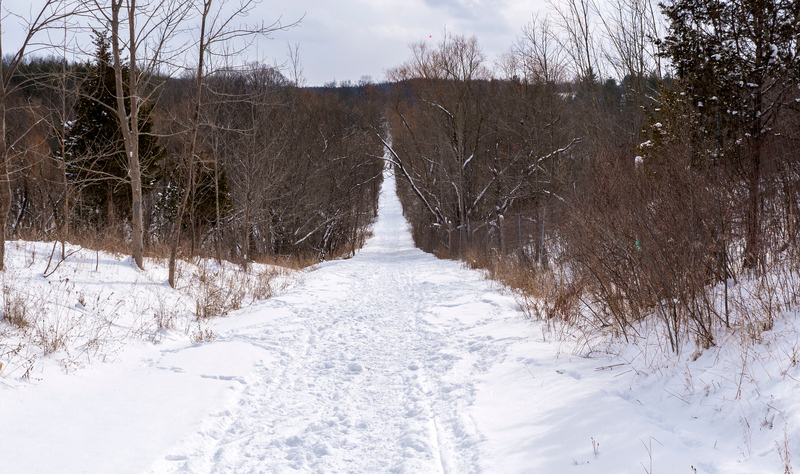 I can see from your awesome photos that hiking in winter has its own charm! Hi! 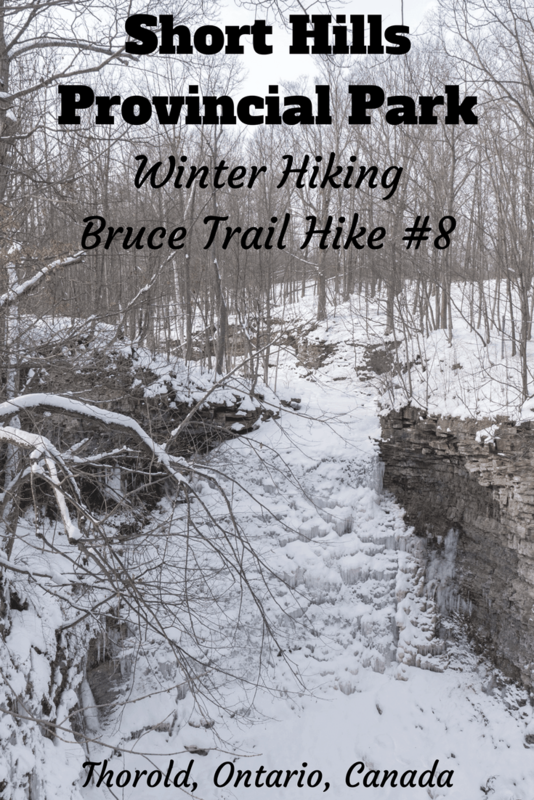 I came across your blog when searching for other Bruce Trail blogs. 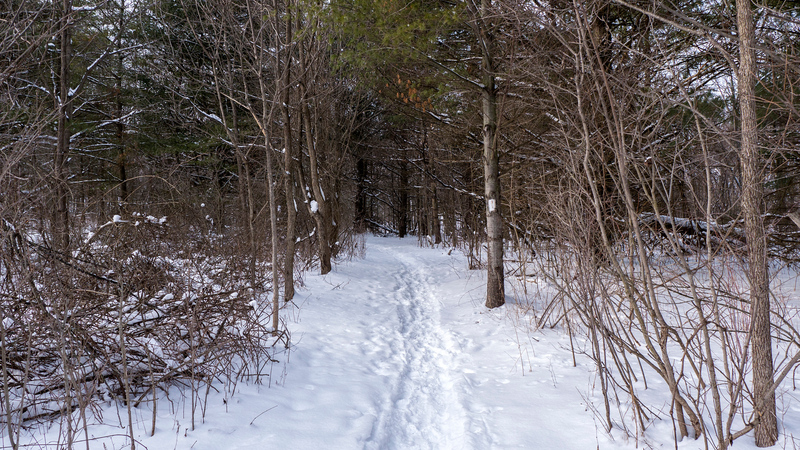 Winter hiking is great because there are no bugs…! Haha I have the same thought about bugs! How far along are you on the Bruce? I’m slowly but surely making my way! It will take me years and years but eventually I’ll make it! Is #8 your last hike on the Bruce? Have you completed any more stretches of the trail?